so it’s increasingly difficult to know where they’re coming from or if they’re even worth buying. The market has practically become saturated with some “no-name” or lesser-known brands, so we’ve decided to begin reviewing some of these, one at at time. This page is dedicated to the Werktough 18V Cordless Impact Wrench. First things first: right out of the gate, there’s really not an awful lot for us to find in the way of peer reviews from other users of this particular brand. The result of our research is that we had to rely on some very short-term testing and cannot give a very accurate long-term idea of how well the Werktough will perform for you. However, we have done our best to both gather as much information and locate as many peer-reviewed user’s comments as possible in order to provide you with the best overview we’re able. In the overall cordless impact wrench market, the 18V IW03 from Werktough is relatively new, with sales first kicking-in around July of 2017, according to our research. As of today, the wrench can be purchased on Amazon and some other sites or stores, but customers have generally been not so much or simply not very active in leaving any impact wrench reviews. Does it Work Tough, or Just Blow Smoke? In truth, the real mechanic or do-it-yourselfer isn’t going to give (much of) a care about the actual looks of a tool, as long as the performance is there, or better yet, value received for the price. After all, not everyone needs a $500 name-brand impact wrench kit, regardless of whether or not it’s a ‘leet tool! Once we get past the initial first impressions of our visual senses, behind that comes the weight, the feel and, finally, the using. Bulk–The WerktoughThe Werktough catches our attention first with its weight, which is quite considerable for an impact with little to no brand-name support and lower-than-average pricing point. So, where the basic design and name/logo has left us uninspired, the actual feel and weight caused us to feel more hopeful that this could be a rather solid tool, if for nothing more than the cost. Grip–After we get over the initial surprise of the impact’s weight, the next thing we considered was the actual design and feel of the grip in comfort, ease of use, and fatigue factor. To a large degree, much of this can be guessed simply by looking at the tool before we even pick it up. This is one area where not much thought seems to have been given to extended period usage, as there just isn’t as much hand-loving shock absorbency as we would prefer to see. Still, it’s doubtful that Werktough expected Nascar mechanics to be dangling these impacts from their holsters every day while speedily changing tires, so perhaps this is a moot point. The grips are adequate for moderate or occasional use. Extras–since this is indeed a kit and not just a bare-tool setup, you receive some assorted sockets of seemingly acceptable quality. There’s no extended usage to determine how well these accessories perform over time, but considering the fact that many impacts don’t even have a battery or charger, the IW03 just increases its attraction by adding this along with a case, charger, and battery. Surprisingly, it has a larger-than-normal amount of torque and is listed at 400ft-lbs–much higher than most in this price category, including some which we actually recommend. Unboxing the IW03 may not be as eye-pleasing as many would prefer, but due to the amount of goodies received and the weight they have, it appears that this could be Motor Trend feature of “don’t judge an impact by its cover.” Let’s see if the technical details support this possibility. The rotations per minute and impacts per minute are more or less average for a standard impact, so not much to write about there. With our Ryobi review, we discussed how the impacts, while not ‘bad,’ could’ve used a bump-up, it still was acceptable. Nevertheless, the Werktough doesn’t match the Volt One’s performance in the RPM and IPM area, though we weren’t necessarily expecting it to do so, nor are we disappointed about that (especially because of the following). Power–or Torque. This has got to be the top benefit of this particular impact wrench. Boasting 400 lbs/ft, the Werktough impact sets itself apart solely in this area alone. The previously mentioned Ryobi only packs 300 lbs/ft which is nothing to sniff at, but the huge increase in this model makes a considerable amount of difference. Werktough advertises this wrench as being able to change all four car tires on just one fully-charged battery, and depending on your vehicle type, this is actually not a misleading statement. If you have a large truck or quite a number of lug nuts however, then it may struggle a bit as you progress from one hefty lug to the next, so having a spare battery would solve this potential problem. It is a swift, agile impact wrench that absolutely can be the main workhorse for people on the go. The power and torque it possesses is just simply off the charts for its class, which is something almost unheard of in small tools of similar application, price, or design. The biggest benefit to the WT IW03 is the sheer brute force courtesy of its included torque. While the IPMs or RPMs may not be as high as some other models and, in truth, would make this quite an amazing wrench if it did, it still shines notably in the power department. The initial value of this cordless impact wrench is first evident upon picking it up and, due to the torque mentioned above, causes the user to not feel disappointed. So, the cost-to-performance ration is quite good, at least in the short-term. As of the writing of this comprehensive review, there are no long-term user reviews to draw from, but if the Werktough impact enjoys a generally similar level of performance for a couple of years, then we would consider it a high-value, bang for the buck. The third pro is that this item not only comes as a kit with included charger and battery, but also has a few extras such as case and sockets to get you going right out of the box. We actually like the fact that there’s no second battery included, as this would not only jack-up the initial price point, but also become unnecessary to some erratic and/or home users. If an extra battery is desired, one can easily just purchase one. The Impacts Per Minute and Rotations Per Minute are not that high, but we’ll consider this a trade-off due to the sheer power of the torque. In our thinking, the price would probably increase of they were to improve these two areas, so we can’t bash them too much for it. The price is quite reasonable for what you get. (If you’re interested in locating an impact with high IPMs and RPMs, as well as torque, search our other reviews). The design, while not necessarily important from a cosmetic perspective, does indeed matter a bit as it relates to fatigue or discomfort for the user. Because the Werktough impact strikes us as a mid-to-low-level tool and not meant for long days of constant work, it may not be such a big deal. However, we believe that it’s not so hard to create a grip which is more comfortable for the user. The location of the LED light is a bit odd and may take a little getting used to, especially if you have large hands and/or use gloves (which we would actually recommend with this impact wrench if you were going to use it often). It’s actually possible for the spray of light to be hindered by your hand or other things if held a certain way or in a certain spot. We’re unsure about this design choice, but it is what it is–perhaps it won’t matter to some users at all! The last thing we’ll mention here is basically the lack of historical data on this impact wrench. As you probably know, it’s not possible for us to give you a review TODAY about a drill’s performance one or even two years from now, so we have to look backwards and glean what information we can from other sources. However, there is a lack of information in this area, so the best we can tell you is to spend your money as wisely as you’re able and accept the results. The price of the Werktough IW03 kit is quite low, so it seems a reasonable risk, but that is up to you to decide. 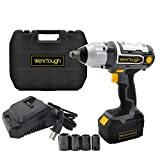 For those looking to avoid the headache and waste of precious time connected to buying poor-quality tools but unable (or unwilling) to fork over their hard-earned dough for a more trusted name-brand impact wrench, the IW03 Cordless Impact from Werktough can be a good option to look at, provided one does their research beforehand and makes their purchase from a reputable dealer. It is always a good idea to check out the warranty information before committing to any significant purchase, but if you’re looking for something to last for a while, it’s a must. Because this impact doesn’t have a lot of history to draw on, checking out the warranty is also our suggestion to you. IPMs and RPMs aren’t what we’d call “low,” especially for the price range, but the torque is surprisingly high–even higher than many similar models. For this reason alone, the WT wrench becomes a player in its own right, at least for the random odd job or occasional user. The kit comes ready with everything you need to get going and snugly stows away in your car or truck for whenever you may need it to change a tire (or whatever else you enjoy doing randomly with an impact wrench). Changing one tire is no problem at all for this tool, so it’s a bargain for those looking for a cheap kit to transport or to have as a safety precaution. The weight is a bit much but it seems necessary given the amount of power it has, not to mention that it helps to offset how it feels as it reacts with the lug nuts. Furthermore, this is useful as the wrench doesn’t go “all-out” in providing a cushy grip experience for the user, so the weight actually helps to fight off some of that added hand stress. All in all, we’ll have to give our own personal score of 3.25 out of 5 to the Werktough impact wrench. Due to lower-than-desired RPM/IPM, so-so grip, odd LED light location, and lack of knowledge of the tool’s sustainability (not to mention informational awareness via videos and other related company materials). Still, for the price, this kit could be a great fit for the right people, although we wouldn’t begin to consider it for a professional’s daily use.